In piSignage the displays can be turned Off centrally , i.e No need to manually/physically turn off each screen at its location. The display is turned off by using TV_OFF feature in piSignage. 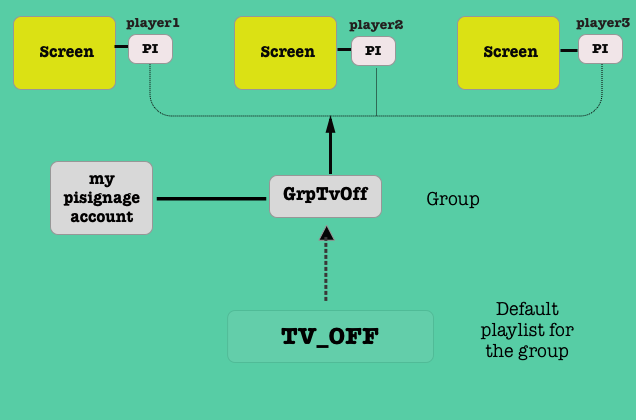 Basically TV_OFF is included as a playlist in piSignage and by deploying this playlist you can turn off the screens. This feature is immensely popular in piSignage offering users a lot of flexibility in turning off screens during scheduled time. Here we will see the working of this feature with a simple example. Out of all the players managed in your account, You have to turn off three players,ie player1, player2, player3. Create a Group , name it appropriately for ease of use. We are naming the group GrpTvOff (refer Screenshot image 2 below). Choose the TV_OFF playlist as default playlist for the group from the drop down menu (image 3 & 4). Leave the rest as it is. If you go back to the groups in left panel you can see the newly created group GrpTvOff (image 5). 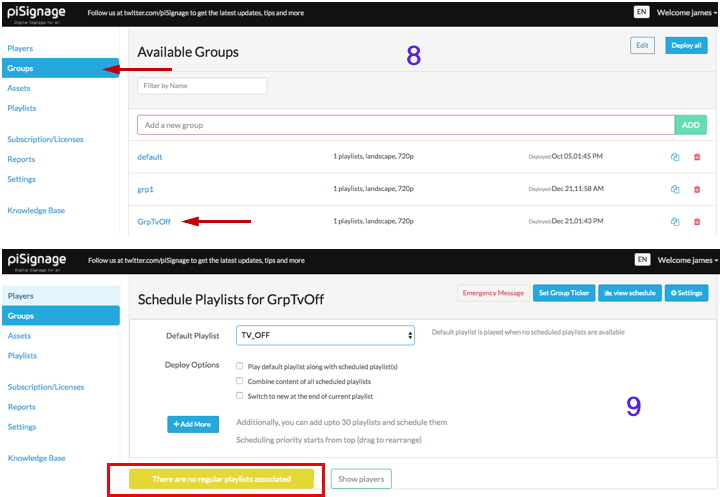 Alternatively You can take any already existing group and make TV_OFF the default playlist (Without additional playlists added). We created a new group in the beginning to just make understanding TV_OFF simpler. 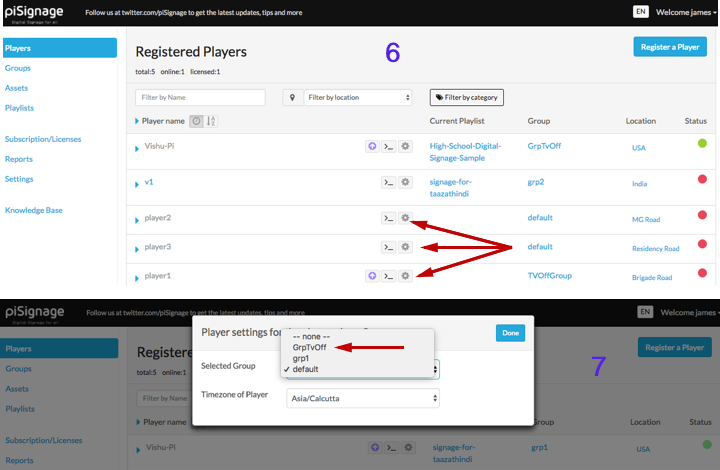 Read the article How Group feature simplifies Player Management in piSignage. This will give you an idea **how and why multiple players are controlled via groups. Click on players in the left panel and all the players are listed (image 6 & 7) . Click on the gear Icon in front of player1. In the popup window which appears change the group of player to GrpTvOff (or any group having a single TV_OFF playlist). As you want player2 and player3 turned off too, repeat the process for both these players. The Group which has a single TV_OFF playlist attached will not have DEPLOY Text in the Button. Instead it will show There are No regular playlist Associated (image 9) This is because TV_OFF is a special purpose playlist. The DEPLOY Text is replaced by the above text in the following scenarios. It is just a reminder to the user and does not change the button functionality. The final account setting represented in an image. 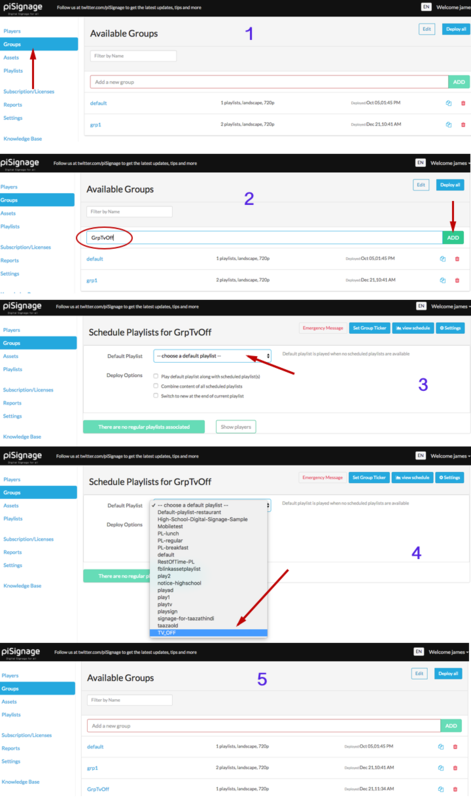 In the Coming blogs we will explore how TV_OFF feature offers great flexibility in scheduling ON/OFF timings with few examples and also share with you some practical use cases.